Check that, your competitors are happy! They are perfectly content that you can’t be bothered with creating or improving your Google Maps listing. They don’t want you listed anywhere on the Search Engine Results Page. Plus, they know something you may not know, Google Maps drives a lot of business (see Google My Business Report below) to them and they don’t want you listed there. Still no time? Just remind yourself how hard you have worked to build your business. Why let your competitors take the low hanging fruit because you don’t understand Google Maps or you don’t have time. Yes, I said it! It is FREE money! Google doesn’t charge you a fee to be listed on Google Maps. This might be the only free marketing tool that can drive substantial traffic to your website. Check out a recent Google My Business Report (below). 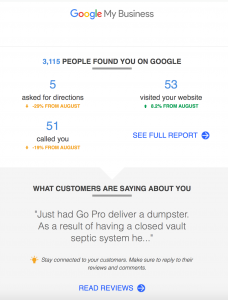 Notice that 3,115 potential customers found this company on Google, 53 customers visited their website and 51 customers called directly from Google Maps. These numbers reflect just one month, behold the power of Google Maps! Google Maps listing requirements are a Gmail account, a Google My Business account and a little time to set up the listing. That’s it! Your business listing describes exactly where you are located and includes business hours, contact information, website address, pictures, and reviews (more on reviews later). If you don’t use Google AdWords, too bad. Screen space! Just pull out a mobile phone and conduct some searches to see why you should be using AdWords. Mobile searches now account for over 50% of online searches. Today’s searchers feel more comfortable clicking on AdWords and Google Maps. Recently, Google added a great new feature that went unnoticed, called Location Extensions. Google allows you to link your Google Maps account with your Google AdWords account with the goal of reaching many more customers. You now can pay to be listed in the Maps section via AdWords. Mobile customers can now call you directly from a Google advertisement, now that’s convenient! 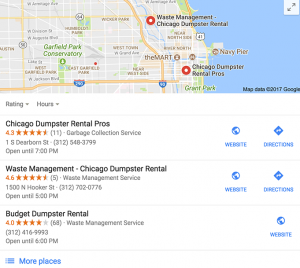 Google Maps now heavily incorporates online reviews into their website ranking algorithm. They look at review rating, quantity, timeliness, plus many more. The increased algorithm emphasis not only affects Google Maps, but also the Search Engine Results Page (SERPs) or more commonly called, the “organic listings”. It makes sense that Google would rely on the public to list the very best companies first. Why are Google reviews so important? A searcher that uses the Google search engine is a customer of Google. Not yours. This is important to understand, Google doesn’t care if you are good people or run a good business. They use an algorithm (robot) to rank your business either first, last or somewhere in-between. You need to show them that you run a good business by letting the public respond in the form of online reviews. If you have bad reviews it gets reflected, if you have little or no reviews, it gets reflected. Customers want information about your company, little or no reviews is the same as having bad reviews. Google uses its own proprietary reviews gathered through Google Maps, they also acquire additional online reviews from trusted, authoritative websites across the internet. HometownLocal’s consumer lead generation website’s meet these strict criteria. HometownLocal only publishes 100% verified reviews that are generated through their platform. Simply put, website users that require service must come through their platform, thereby giving them 100% confidence in their reviews. HometownLocal publishes all verified reviews, good, bad or ugly, this gives Google confidence that HometownLocal reviews are authentic, true customer experiences. Google Maps allows you to describe who you are, what you do, and where you are located. An accurate Maps listing helps ensure you come up correctly in Google searches, not only in Maps but also in the organic search engine results page (SERPs). Every bit of information (accurate or otherwise) that you provide Google will allow them to develop trust (or not) in your business. The more trust they develop in your business, the higher probability that your business will be displayed to potential customers. Seriously, what are you waiting for? By using Google Maps and linking your Maps account to Google AdWords, you will see results very quickly. Interested in taking your business to the next level? Contact HometownLocal, a trusted Google Partner, to help increase the number of leads you receive.